Are we clear about the key lessons on how to take a ‘good idea’ for improving learning, teaching and assessment in higher education and making sure it is successfully and consistently put into practice and sustained? Box Eleven summarises the key lessons from 30 years’ research and practical experience with effective change implementation in higher education that were reviewed during the workshops. When engaging with staff first listen (with a case for change and options known to work elsewhere) to find out what staff see as the most relevant and feasible way to proceed; link together what most people favour; then leverage what you find by commissioning a subgroup of staff to try out the preferred solution under controlled conditions. Finally when a workable solution is developed you lead – scale up this version using the team which developed it as coaches. Remember that there is a profound difference between ‘change’ (something becoming different) and ‘progress’ (a conclusion by individuals that this is an improvement on what went before). List out the key challenges you have faced in seeking to improve learning, teaching and assessment at your institution. Then discuss how best to address them. As you do this compare your views with the key lessons in Box Eleven and the challenges and ways of handling them suggested during the Fellowship workshops and summarised in Box Twelve. Below the key change challenges identified by local Learning and Teaching leaders during the workshops are clustered into three themes: how to engage all staff; how to align the institution’s systems and culture with the change; and how to negotiate externally driven change challenges successfully. Some specific challenges associated with implementing the achievement standards and assessment agenda are also identified. When you click on a challenge area you will come to the suggested ways of handling it provided by Fellowship participants. How to engage all staff not just the enthusiasts? How to move beyond ‘preaching to the converted’ and the learning and teaching enthusiasts to engaging everyone with change –including those who are unengaged and the growing number of sessional staff who may be isolated from mainstream action. Seek a senior mentor in the Executive to champion the achievement standards and assessment agenda and endorse its importance. Undertake a stocktake of what is currently working effectively at the local level in your higher education institution in each aspect of the six keys framework at the outset. In this way focus more on engagement and listening than on dissemination and telling. Then acknowledge that the change process is building on/scaling up this effective practice which is already underway in your college or university. This builds ownership and shows that what is proposed is feasible and already successfully underway, albeit in pockets, in the HEI. This strategy is a practical example of the key change leadership strategy identified in all of the successful higher education leadership studies to date and roundly endorsed in every Fellowship workshop – effective change leaders and change capable universities always listen first (with a focus), then link, leverage and lead (scale up) in that order. Include tracking items in student feedback surveys that cover the quality of learning outcomes and assessment and use the results to help those with lower ratings for their assessment approaches by linking them to those who are attracting higher ratings. targeted involvement in external networks focused on aspects of the six keys agenda to identify successful ways to tackle any challenges. In terms of sessional staff support participants suggested that reference to the BLASST Sessional Staff Standards Framework would be useful. Keep in mind that there is a profound difference between ‘change’ (something becoming different) and ‘progress’ (a value judgement by the individual concerned this has been/will be ‘beneficial’). Put in place an assessment-focused learning guide system for each unit of study and require all staff to ‘teach’ it in the first session of each unit delivery. Always listen to ‘resisters’ – because this will help you find out what change implementation challenges you have to address and because, if listened to carefully, they will often come up with a positive idea that can be acknowledged to others, thereby creating a positive not a negative incentive for them to engage. Always listen to resisters before a meeting and always discuss difficult issues personally before emailing to confirm what was discussed and the actions this it was agreed would be taken. How best to engage senior executives and key external players with the achievement standards and quality assessment agenda? Develop a ‘why bother’ case that shows how this initiative meets the motivators of each of these leaders and their particular priorities. Start, therefore, with the ‘why’ not the ‘what’ – and go for both the heart and the head. Listen (with a menu of relevant initiatives that have worked elsewhere and ask for their feedback on whether any of these might be worth pursuing) and link (what most leaders find most relevant and feasible) into a proposed plan of action. Don’t tell. Articulate both the business case for the change and how it will achieve the institution’s/nation’s key development objectives and ‘moral purpose’ ¬– demonstrate the positive benefits for reputation, demand, retention, income and graduate success. Use peer pressure between senior leaders in different higher education institutions as potentially relevant extra incentive to foster engagement. Give leaders the language to use – but keep it simple by using plain English and avoiding ‘eduspeak’. Develop a searchable clearing-house of exemplars of successful implementation using the ‘6 keys’ framework as an organising system. Alert academics to the relevant sections of this guide when they need ideas, tips and examples of how others have carried out a particular aspect of the six keys framework. Recognise that change is a complex learning and unlearning process for all concerned – it is not an event. So apply the same engagement motivators for staff and the same active, ‘just-in-time and just-for-me’ learning methods as we use with students. Foster networked learning – a key form of learning for leaders. Meet less but meet better – consider undertaking meetings by teleconference to save travel time, especially when everyone knows one another. Undertake an audit of meetings to identify exactly how each of them ‘adds value’ to student outcomes and effective operation – remove or decrease the number of those that don’t meet this test. Ensure that those who chair meetings are trained and hold people who agreed to undertake an action in a previous meeting to account in the next one. Set a smaller number of institutional priorities for action and foster a ‘steered engagement’ strategy for implementing them in locally suitable ways. Recognise that change capable cultures are build by change capable leaders modelling the top rating capabilities of effective leaders – especially when things go awry or an unexpected opportunity arises. Set up a ‘nested’ leadership system to help overcome this. Emphasise consensus around the data not just around the table. Argue for and show the institutional benefits of ‘nested leadership’ and the benefits of the DVC/PVC holding ‘stocktake meetings’ with Heads of Program as well as A/Deans, Deans and Heads of School. For one model see the UWS (WSU) Head of Program initiative. Put in place clear senior leadership accountabilities for the successful implementation of the agenda with appropriate support and rewards for successful implementation. the use of dilemma-based assessment, capstones and other forms of ‘powerful’ assessment that attract high levels of student satisfaction and show a positive impact on student outcomes. Reward successful, collaborative action in this area in the annual VC awards and in promotion systems. 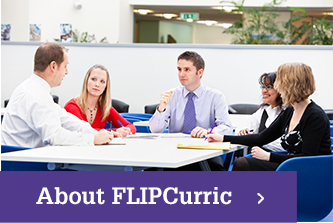 Suggest the adoption of an online course development and review system based on the notion of ‘flipping the curriculum’ and using the ‘six keys’ framework – align policy and procedures to this and allocate key central and local leaders to be accountable for its effective operation and support. Provide exemplars written by successful program teams for each of the ‘six keys’ in order to help teams new to the process see how it works in practice. Advocate for HR promotion systems to reward demonstrable success in addressing the achievement standards and assessment quality system. Set up local ‘coaches’ on the ‘six keys’ framework – people who have already successfully engaged with each element. Build these local coaches into a university wide network convened by a senior leader. Review leadership promotion criteria and ensure that the top ranking capabilities for each local and central leadership role take into account the top 10 highest ranking capabilities identified in the learning leaders and other HE leadership studies. Identify and share effective strategies for alerting students from this increasingly wide range of backgrounds, abilities, needs and experience to how assessment works. For example, invite successful third year students from particular groups to write a ‘lonely planet’ guide for people from the same background just entering university on how assessment works. Targeted guides can be produced for Indigenous, mature aged, first in family and international students from specific countries. Use this as part of the ‘why bother’ case with colleagues when seeking their engagement with the achievement standards and quality assessment agenda. Show how the capabilities being developed are directly relevant to successful early career performance. Use what external auditors and accreditors are looking for as an internal change lever. Note that what auditors look for is evidence of a change capable, quality-focused university/college culture – the key attributes include: consistency, equivalence, evidence-based improvement action, accountable leadership and demonstrably positive student outcomes and impact. External accreditation requirements that don’t align with the validated professional capability framework endorsed during the Fellowship. Introduce the accrediting agencies to the validated capability framework in this guide and to the outcomes of studies of successful early career graduates in the profession concerned (link to the successful graduates section in the references), with the aim of working together to further enhance and sharpen their current framework and better position the profession concerned. ‘Digital disruption’ and a tendency to modularise and disaggregate learning into discrete packages of information. Show that what counts for successful employment, entrepreneurship and effective early career performance is what the studies of successful, work-ready plus early career graduates have revealed : that the most effective performers are able to operate proactively, inventively and productively in a rapidly changing, transdisciplinary world where it is the effective integration of personal, interpersonal, cognitive capabilities of the type outlined earlier in the guide that count not merely the possession of high levels of current skills and knowledge (competencies). Explore the use of new interactive ICT tools for dilemma-based/problem-based assessment simulations to enable scale-up in the use of this ‘powerful’ approach to assessment & learning and to put paid to the myth that ‘information is learning’. Use this as part of the ‘why bother’ case with staff when seeking their engagement with the achievement standards and quality assessment agenda – by showing that if we are not able to retain ‘market share’ and optimise retention and success students may go elsewhere and that, as a consequence, their jobs may be under threat due to the loss of income. Emphasise that for every student lost at the end of first year some $20k in government funding is lost (the amount provided by government for years 2 and 3 of an undergraduate degree). These change challenges and the suggestions for handling them align with the specific challenges Fellowship participants said they had encountered when seeking to enhance the quality of achievement standards and assessment. These are identified in Box 13. Group assessment and ‘free loaders’. Sessional staff are not always engaged or ‘in the loop’. See the research with 500 experienced L&T leaders in the 2008 OLT/ALTC funded Learning Leaders in Times of Change project; in the ATEM LH Martin Institute study with 159 professional leaders tertiary education in Australia & NZ and in the 2013 study of 188 successful leaders of education for sustainability in universities and colleges around the world. For a practical guide from Canada on this area see: Higher Education Quality Council of Ontario (2015): Learning outcomes assessment: a practitioner’s handbook, HEQC, Toronto, Canada. Section 3. Pgs 43ff. For additional suggestions on handling implementation ‘hot-spots’ see Barrie et al (2012): Assessing and assuring Australian graduate Learning outcomes, OLT, Sydney. Simon Barrie and colleagues identify some key policy issues related to the assurance of graduate learning outcomes in Table One on pg 54 of their report. Here they identify a range of relevant policy issues and then summarise why each is an issue and make suggestions on how each might best be addressed. The issues and way of handling them which are covered include: fragmented program assessment design; policy gaps and inconsistencies; addressing grading quality and cut-offs; use of norm-referenced moderation; mandatory provision of detailed criteria and standards for assessment judgement; mandatory variety in assessment tasks; assessment balance and feedback, inclusion of non achievement factors like class attendance in grade calculations.